…and some of them were a tad rude. I attended the inaugural “Meet the Mayor” session yesterday and was impressed with the Mayor’s focus. Since I can’t find any press coverage, I am providing a summary and a little editorial comment of my own. (I’m a blogger not a journolist. Misspell intentional.) I had to leave a little early, and I left a little earlier than I had to, which I will discuss later. There were about 75 people on hand for the event. 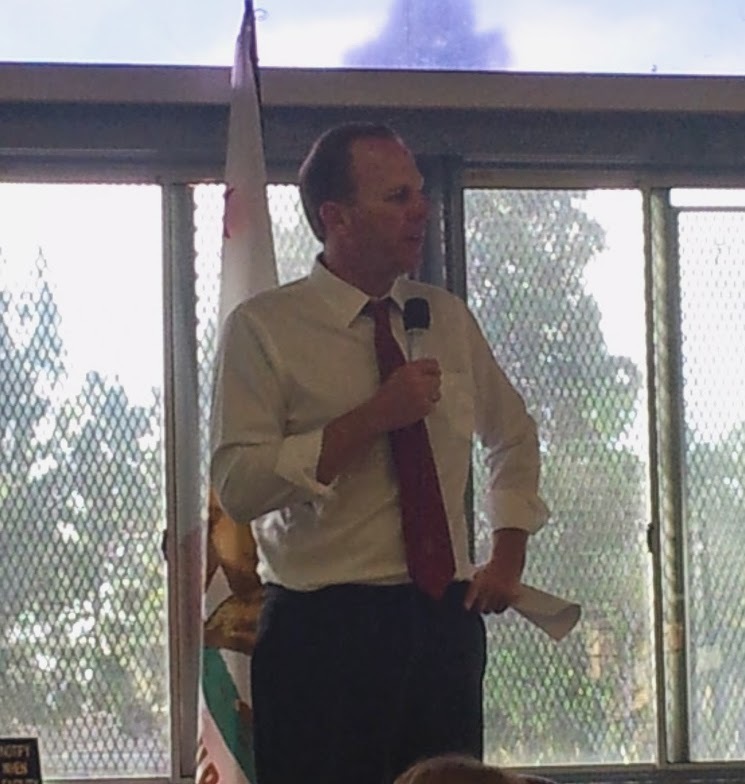 Faulconer took the stage and joke about being feeling even taller than usual. He summarized some key early accomplishments and efforts from his new administration. The appointment of new Police Chief Shelley Zimmerman is going to result in clear standards of conduct for officers and clear expectations. The new budget will have funds for recruiting and retention of officers. The mayor met with the mayor and city council of Tijuana, an important regional relationship. Manufacturing on either side of the border can result in increased jobs for the region. He will emphasize open government. He has killed the policy on deleting emails after one year. The U.S. Open is coming to San Diego in 2021. He can’t guarantee as exciting a finish as Tiger Woods vs Rocco Mediate in 2008. He appointed of Kris McFadden to start fixing issues with storm water and the streets as head of Storm Water and Transportation. He has one month to prepare the city budget. The budget priorities will be on investments in neighborhoods that have been neglected, continuing pension reform and competition for services. Specifically he will target more street repairs, library hours and recreation center hours. The recovering economy and reforms are paying off. He wants to bring a customer service attitude for all of the city. The city is delivering services for the taxpayer who pays the bills. His major focus is on getting San Diegans back to work. Not only getting new companies to come to the city, but allowing existing companies to expand operations. A healthy economy is key to providing the money to pay for the needed services the city provides. Q: [I had a little difficulty understanding this first question] What are we doing with Community Development Block Grant (CDBG) funding with regards to neighborhoods? A: The mayor discussed using some of the money to repair sidewalks by shifting a greater percentage of the money to the city. Q: Rambling question about Sea World and reading from an LA Times editorial about orcas in captivity. Faulconer politely asked what the question might be. A: Sea World’s 50th anniversary was cause for city recognition. They are a national leader in conservation. The city council unanimously recognized Sea World with a proclamation of March as “Sea World” month. This was the first PETA activist question. This was Q&A for the mayor, not a forum to grandstand. Q: Clairemont-Mesa Blvd and Morena have huge potholes that need fixing. [Ed comment: Oh yeah! and add Clairemont Dr.] Also many of the boards and commissions run by the city need members. A follow on discussion on the Balboa park celebration ensued. He said that the celebration would be something San Diegans could be proud of and would be affordable. It will focus on the park and museums and San Diego’s heritage. A grandiose “international” celebration is not in the works. He noted that if an L.A. firm had been involved as the key planner, that is no longer the case. Q: Pulling permits is arduous and difficult process. It’s a horrible process. What can you do? A: “We can do something.” Faulconer promised the city will have clear rules of the road and will play no favorites in the permitting process. He added that the city will speed up the process and make known the stage of the process through an on-line system. “Time is money.” Getting permits process improved is tied to economic development in his view. Q: A Sorrento Vally man asked why there was not community signage for Sorrento Valley, unlike Clairemont or other neighborhoods. He said that the city seems to have no rules and no process to make this decision. A: “I don’t like to hear ‘no rules, no process. '” [Ed note: I loved that this was his first instinct. We need this in the mayor’s office after Filner’s multiple illegal debacles.] He directed his aide to put it on the board to look into. Q: Where are we at with the Oversize Vehicle Ordnance? A: The mayor said that although the council has approved the ordnance, it must still be reviewed by the California Coastal Commission. However, San Diego is the only large coastal city that lacks such a law. He anticipates a late summer or early fall decision and the city will present a full defense of the law. Q: Some crank started to talk about the courts and the banking system and rambled on. A: Faulconer answered patiently that the courts were not in the mayor’s jurisdiction. He noted that Chief Zimmerman was re-instituting a professional standards unit for the police. At this point two more questioners, obviously from PETA started in on Sea World again. They were reading prepared statements, in one case off their cell phone. At one point, the mayor asked if there was a question in there. He stated that he respected their right to their opinion, but that there was obviously a difference of opinion. He handled with all the class the previous mayor lacked. I was not so sanguine. At this point I walked out of the meeting, and I admit to uttering a profanity sotto voce on my way out. (I was the tall guy in blue shirt and tie, if you were there.) I don’t respect PETA activists because they do not deserve respect when they hijack a question and answer session for the community with their grandstanding. In general, PETA uses violent and illegitimate methods because their belief that humans are lower than animals is illegitimate. Its clear to me that the activists at the meeting were mentally damaged already, so my display of pique wasn’t going to change that. Overall, Mayor Faulconer was the excellent communicator and level headed, classy guy I voted for. This was a great event. I really liked this piece, especially how you intentionally misrepresented a group’s platform (that PETA believes “humans are lower than animals”) and then called them retards (sorry, you said “mentally damaged”), while opining on meaning of class. Seriously? Why don’t you research how many cetaceans they’ve contributed to killing. You’re mayor is an idiot…either a completely uninformed one, or just one who accepts corporate bribes. Whether or not you believe people are “mentally damaged” is clearly your opinion. But it is people like you who are contributing to the emotional instability and breakdown of our society, by thinking YOU are better than anyone or anything else on this planet. And I’m a Republican….just for the record. Oh, I don’t think the author thinks he’s “better,” but certainly he’s a higher-form of mammal than cetaceans; that’s just scientific fact.. The notion that certain animals have “rights” is a very dangerous path to traverse. At least one of the individuals who was a PETA activist publicly agreed that Sea World was in fact a national leader in conservation. I did not make the claim, the mayor did, as my article makes clear.